While there are many who will be making a pilgrimage to center city Philadelphia this weekend because of their faith, there are also many in the “New Church of thy Chip” congregation who have started to lose faith, hope, and have been overcome by a sense of despair after what took place at the Linc on Sunday afternoon. And who can blame them? 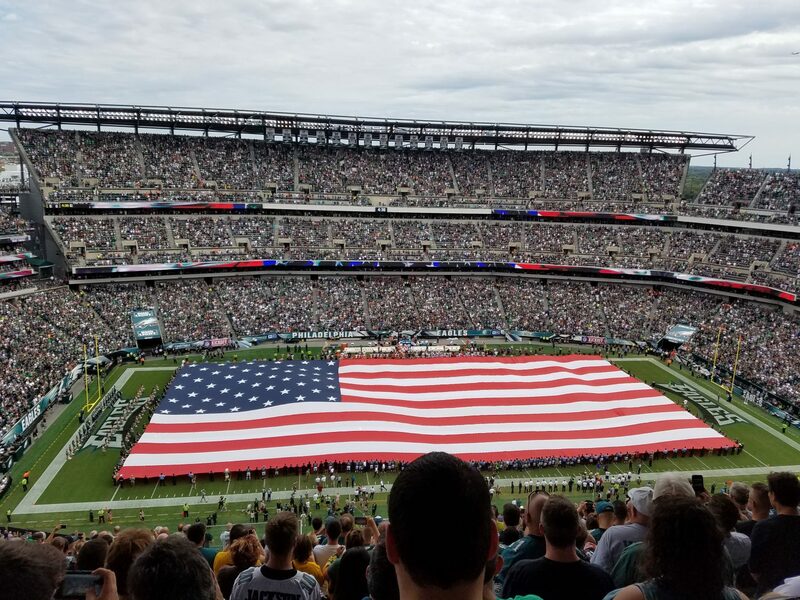 The Eagles running game amassed a total of seven yards rushing on Sunday, which was surpassed only by a fan who managed to run out onto the field during the 2nd half to offer some “words of encouragement” to the Eagles defense. Unfortunately, the fifty yards he gained on one carry were nullified due to a disorderly conduct penalty and, most likely, a hefty fine as well. But placing blame for the lack of offense on the shoulders of Eagles running backs DeMarco Murray, Ryan Mathews, and Darron Sproles would surely be an injustice. The Eagles could have had Jim Brown, Eric Dickerson, and Barry Sanders on the roster and it wouldn’t have made a bit of difference on Sunday. No, the lack of offense falls on no one else but the offensive line, which was nothing if not plain offensive. It seemed like the line was missing blocks on every play, but perhaps that is a byproduct of both of the starting guards from last season, Todd Herremans and Evan Mathis, being released before the 2015 season began. Mathis was not happy with his contract, but it was a boneheaded move on his part not too show up for the offseason OTA’s (Organized Team Activities), as no one else was going to give him the money that the Eagles were paying him. But the Eagles would have been better off on Sunday having an unhappy Mathis playing guard than either Allen Barbre or Andrew Gardner. But the bigger problem is that it wasn’t just the guards that didn’t play well. The whole offensive line, including tight end Brent Celek and Jason Kelce, two players who are usually very reliable, chose Sunday to have one of the worst games of their careers. The “New Church of thy Chip” preaches that “culture beats scheme”. But on Sunday, the Eagles “culture club” looked like they had ‘Boy George” out there playing on the offensive line. Rumor has it that Boy George wanted to make like a “Karma Chameleon” and disappear without being noticed after that performance. But while the offensive line was the biggest problem, there was enough blame to go around. Quarterback Sam Bradford did not have enough time to throw for most of the afternoon, but when he did, he did nothing to make us forget about Nick Foles. Of course, Foles did not do enough here to make us forget about Michael Vick, and Vick did not do enough to make us forget about Donovan McNabb (you see where I’m going with this). Then there is the defense, which played respectably considering how much time they were on the field. But the biggest concern is that their prized free agent signing, Bryon Maxwell, may turn out to be this year’s Nnamdi Asomugha. Asomugha, as you may recall, was the Eagles prized free agent cornerback signing before the 2011 season. But after his two years here, he was probably best known for being a guy who ate his lunch in his car during practices. I personally have no clue where Byron Maxwell eats his lunch, but he has been feasted on one too many times by both the Falcons and the Cowboys thus far. This week, the Eagles are at a crossroads of sorts. Win against the Jets (which does not seem to be the “gimme” it once was), and it gives the fans a glimmer of hope for at least another week. Lose, and a football season that once held the promise of a deep playoff run may unfortunately be over before the leaves have fallen off the trees. Lose, and there will be a plethora of unanswered questions concerning the players, the coaching staff, and the management. Lose, and basically everything that has taken place over the last three years of the Chip Kelly regime will have to be questioned. Lose, and one has to wonder if Vince Lombardi has actually put a curse on the Eagles for being the only team ever to defeat his Packers in a championship game (1960), which was ironically, the last time this team has won it all. Lose, and it will be a long and cold fall and winter, no matter what global warming, El Nino, and El Nina may do. Surely, the Eagles cannot start 0-3 while the Jets start 3-0, right? That is only supposed to take place in some parallel universe in the twilight zone that is conjured up by someone with a very sick mind. Perhaps, to put a positive spin on it, what this team needs is time to jell. Perhaps it might take even a 1-3 start before this team starts clicking on all cylinders, much like they did in Chip Kelly’s 1st season.